The condition called hypoglycemia is literally translated as low blood sugar. Hypoglycemia occurs when blood sugar (or blood glucose) concentrations fall below a level necessary to properly support the body’s need for energy and stability throughout its cells. Carbohydrates are the main dietary source of the glucose that is manufactured in the liver and absorbed into the bloodstream to fuel the body’s cells and organs. Glucose concentration is controlled by hormones, primarily insulin and glucagon. Glucose concentration is also controlled by epinephrine (adrenalin) and norepinephrine, as well as growth hormone. If these regulators are not working properly, levels of blood sugar can become either excessive (as in hyperglycemia) or inadequate (as in hypoglycemia). If a person has a blood sugar level of 50 mg/dl or less, he or she is considered hypoglycemic, although glucose levels vary widely from one person to another. 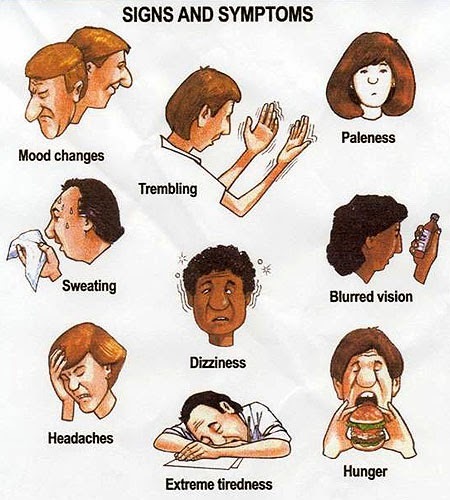 Hypoglycemia can occur in several ways. Drug-induced hypoglycemia, a complication of diabetes, is the most commonly seen and most dangerous form of hypoglycemia. Hypoglycemia occurs most often in diabetics who must inject insulin periodically to lower their blood sugar. While other diabetics are also vulnerable to low blood sugar episodes, they have a lower risk of a serious outcome than do insulin-dependent diabetics. Unless recognized and treated immediately, severe hypoglycemia in the insulin-dependent diabetic can lead to generalized convulsions followed by amnesia and unconsciousness. Death, though rare, is a possible outcome. In insulin-dependent diabetics, hypoglycemia known as an insulin reaction or insulin shock can be caused by several factors. These include overmedicating with manufactured insulin, missing or delaying a meal, eating too little food for the amount of insulin taken, exercising too strenuously, drinking too much alcohol, or any combination of these factors. Idiopathic or reactive hypoglycemia (also called postprandial hypoglycemia) occurs when some people eat. A number of reasons for this reaction have been proposed, but no single cause has been identified. In some cases, this form of hypoglycemia appears to be associated with malfunctions or diseases of the liver, pituitary, adrenals, liver, or pancreas. These conditions are unrelated to diabetes. Children intolerant of a natural sugar (fructose) or who have inherited defects that affect digestion may also experience hypoglycemic attacks. Some children with a negative reaction to aspirin also experience reactive hypoglycemia. It sometimes occurs among people with an intolerance to the sugar found in milk (galactose), and it also often begins before the onset of diabetes. Fasting hypoglycemia sometimes occurs after long periods without food, but it also happens occasionally following strenuous exercise, such as running in a marathon. When carbohydrates are eaten, they are converted to glucose that goes into the bloodstream and is distributed throughout the body. Simultaneously, a combination of chemicals that regulate how the body’s cells absorb that sugar is released from the liver, pancreas, and adrenal glands. These chemical regulators include insulin, glucagon, epinephrine (adrenaline), and norepinephrine. The mixture of these regulators released following digestion of carbohydrates is never the same, since the amount of carbohydrates that are eaten is never the same. Interactions among the regulators are complicated. Any abnormalities in the effectiveness of any one of the regulators can reduce or increase the body’s absorption of glucose. Gastrointestinal enzymes such as amylase and lactase that break down carbohydrates may not be functioning properly. These abnormalities may produce hyperglycemia or hypoglycemia, and can be detected when the level of glucose in the blood is measured. Cell sensitivity to these regulators can be changed in many ways. Over time, a person’s stress level, exercise patterns, advancing age, and dietary habits influence cellular sensitivity. For example, a diet consistently overly rich in carbohydrates increases insulin requirements over time. Eventually, cells can become less receptive to the effects of the regulating chemicals, which can lead to glucose intolerance. Diet is both a major factor in producing hypoglycemia as well as the primary method for controlling it. Diets typical of Western cultures contain excess refined carbohydrates, especially in the form of simple carbohydrates such as sweeteners, which are more easily converted to sugar. In poorer parts of the world, the typical diet contains even higher levels of carbohydrates. Fewer dairy products and meat are eaten, and grains, vegetables, and fruits are consumed. This dietary trend is balanced, however, since people in these cultures eat more complex carbohydrates, eat smaller meals, and usually use carbohydrates more efficiently through physical labor. Mild attacks, however, are more common in reactive hypoglycemia and are characterized by extreme tiredness. Patients first lose their alertness, then their muscle strength and coordination. Thinking grows fuzzy, and finally the patient becomes so tired that he or she becomes “zombie-like,” awake but not functioning. Sometimes the patient will actually fall asleep. Unplanned naps are typical of the chronic hypoglycemic patient, particularly following meals. Additional symptoms of reactive hypoglycemia include headaches, double vision, staggering or an inability to walk, a craving for salt and/or sweets, abdominal distress, premenstrual tension, chronic colitis, allergies, ringing in the ears, unusual patterns in the frequency of urination, skin eruptions and inflammations, pain in the neck and shoulder muscles, memory problems, and sudden and excessive sweating. Unfortunately, a number of these symptoms mimic those of other conditions. For example, the depression, insomnia, irritability, lack of concentration, crying spells, phobias, forgetfulness, confusion, unsocial behavior, and suicidal tendencies commonly seen in nervous system and psychiatric disorders may also be hypoglycemic symptoms. It is very important that anyone with symptoms that may suggest reactive hypoglycemia see a doctor. Because all of its possible symptoms are not likely to be seen in any one person at a specific time, diagnosing hypoglycemia can be difficult. One or more of its many symptoms may be due to another illness. Symptoms may persist in a variety of forms for long periods of time. Symptoms can also change over time within the same person. Some of the factors that can influence symptoms include physical or mental activities, physical or mental state, the amount of time passed since the last meal, the amount and quality of sleep, and exercise patterns. Once diabetes is diagnosed, the patient then monitors his or her blood sugar level with a portable machine called a glucometer. The diabetic places a small blood sample on a test strip that the machine can read. If the test reveals that the blood sugar level is too low, the diabetic can make a correction by eating or drinking an additional carbohydrate. Reactive hypoglycemia can be diagnosed only by a doctor. Symptoms usually improve after the patient has gone on an appropriate diet. Reactive hypoglycemia was diagnosed more frequently 10–20 years ago than today. Studies have shown that most people suffering from its symptoms test normal for blood sugar, leading many doctors to suggest that actual cases of reactive hypoglycemia are quite rare. Some doctors think that people with hypoglycemic symptoms may be particularly sensitive to the body’s normal postmeal release of the hormone epinephrine, or are actually suffering from some other physical or mental problem. Other doctors believe reactive hypoglycemia is actually the early onset of diabetes that occurs after a number of years. There continues to be disagreement about the cause of reactive hypoglycemia. A common test to diagnose hypoglycemia is the extended oral glucose tolerance test. Following an overnight fast, a concentrated solution of glucose is drunk and blood samples are taken hourly for five to six hours. Though this test remains helpful in early identification of diabetes, its use in diagnosing chronic reactive hypoglycemia has lost favor because it can trigger hypoglycemic symptoms in people with otherwise normal glucose readings. Some doctors now recommend that blood sugar be tested at the actual time a person experiences hypoglycemic symptoms. Treatment of the immediate symptoms of hypoglycemia can include eating sugar. For example, a patient can eat a piece of candy, drink milk, or drink fruit juice. Glucose tablets can be used by patients, especially those who are diabetic. Effective treatment of hypoglycemia over time requires the patient to follow a modified diet. Patients are usually encouraged to eat small but frequent meals throughout the day and, avoid excess simple sugars (including alcohol), fats, and fruit drinks. One of the herbal remedies commonly suggested for hypoglycemia is a decoction (an extract made by boiling) of gentian (Gentiana lutea). It should be drunk warm 15–30 minutes before a meal. Gentian is believed to help stimulate the endocrine (hormone-producing) glands. In addition to the dietary modifications recommended above, people with hypoglycemia may benefit from supplementing their diet with chromium, which is believed to help improve blood sugar levels. Chromium is found in whole-grain breads and cereals, cheese, molasses, lean meats, and brewer’s yeast. Eating oats can help stabilize blood sugar levels. Daily supplements of vitamin E are also recommended. People with hypoglycemia should avoid alcohol, caffeine, and cigarette smoke, since these substances can cause significant swings in blood sugar levels. Those patients with severe hypoglycemia may require fast-acting glucagon injections that can stabilize their blood sugar within approximately 15 minutes. Preventing hypoglycemic insulin reactions in diabetics requires taking glucose readings through frequent blood sampling. Insulin can then be regulated based on those readings. Maintaining proper diet is also a factor. Programmable insulin pumps implanted under the skin have proven useful in reducing the incidence of hypoglycemic episodes for insulin-dependent diabetics. In early 2002, scientists announced that a new therapy involving a synthetic insulin called insulin glargine in combination with one of several other short-acting insulins could provide a new alternative for diabetics at risk for hypoglycemia. The synthetic insulin combination acted safely in all patients, including children, and did not cause hypoglycemia like rapid-acting insulins. The onset of reactive hypoglycemia can be avoided or at least delayed by following the same kind of diet used to control it. While not as restrictive as the diet diabetics must follow to keep tight control over their disease, it is quite similar. Include protein in all meals and snacks, preferably from sources low in fat, such as the white meat of chicken or turkey, most fish, soy products, or skim milk. Restrict intake of fats (particularly saturated fats, such as animal fats), and avoid refined sugars and processed foods. Keep a “food diary.” Until the diet is stabilized, a patient should note what and how much he/she eats and drinks at every meal. If symptoms appear following a meal or snack, patients should note them and look for patterns. Eat fresh fruits, but restrict the amount eaten at one time. Patients should remember to eat a source of protein whenever they eat high sources of carbohydrate like fruit. Apples make particularly good snacks because, of all fruits, the carbohydrate in apples is digested most slowly. Follow a diet that is high in fiber. Fruit is a good source of fiber, as are oatmeal and oat bran, which slow the buildup of sugar in the blood during digestion. A doctor can recommend a proper diet, and there are many cookbooks available for diabetics. Recipes found in such books are equally effective in helping to control hypoglycemia. Like diabetes, there is no cure for reactive hypoglycemia, only ways to control it. While some chronic cases will continue through life (rarely is there complete remission of the condition), others will develop into type II (adult-onset) diabetes. 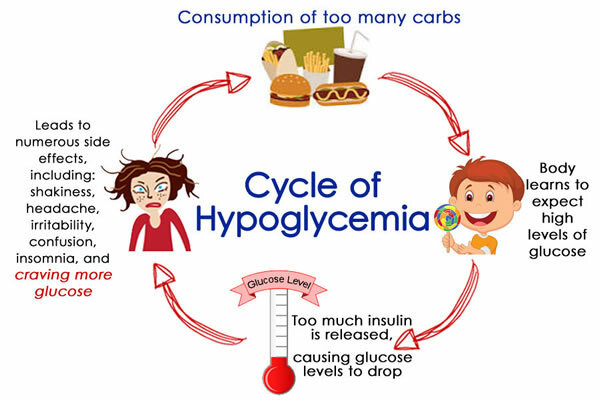 Hypoglycemia appears to have a higher-than-average incidence in families where there has been a history of hypoglycemia or diabetes among their members, but whether hypoglycemia is a controllable warning of oncoming diabetes has not yet been determined by clinical research.